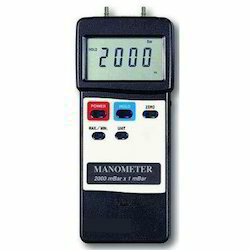 Providing you the best range of low cost digital pressure gauge and digital manometers with effective & timely delivery. Ideal for commercial and industrial applications in both test measurement and general purpose installations. 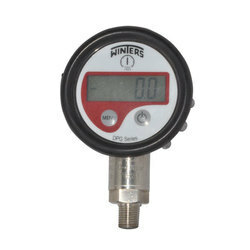 Most digital manometer units work by measuring and comparing the weights of fluids or gases between two different pressures. Any piece of equipment that relies upon a liquid or gas to operate requires a certain amount of pressure to function smoothly. Manometers detect the liquid pressure, sometimes in a U-shaped tube. Often featuring numerous settings and reading capabilities, these devices help to isolate pressure problems in systems from propane and natural gas to backyard barbecue grills. They are sometimes employed to troubleshoot heating ventilation and air conditioning (HVAC) systems and a variety of low-pressure pneumatic or gas systems.